Dental Implants for Missing Teeth in Broseley. Enquire about the cost of Dental Implants in Telford & Bridgnorth. If you have lost one or more teeth, Dental Implants can give you your smile back. Implants are a hard-wearing, long term replacement for missing teeth and are designed to look and feel natural. At Broseley Dental Practice, our dentists have the skill and expertise to offer patients Dental Implants which can replenish and restore the gaps left by missing teeth. 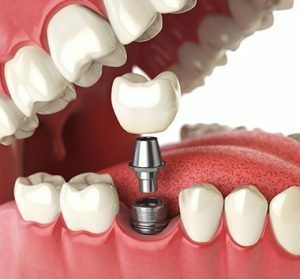 A dental implant replaces the root of a missing tooth with a titanium post which is embedded into the jaw bone. An abutment is placed on top of the implant and a crown is attached to this. Whether you have lost a tooth due to decay or trauma or it has been extracted, an implant is the most preferred restorative technique. It is important to start the implant process as soon as a natural tooth has been removed. This is to prevent any deterioration of the jaw bone and to ensure it can hold the titanium implant. At Broseley Dental Practice, we offer patients Single Dental Implants and Implant Retained Dentures.